In one of his final acts as Head of the European Union Border Assistance Mission (EUBAM) to Moldova and Ukraine, Mr Udo Burkholder presented on April 16 details of EUBAM’s annual report (December 2011 – November 2012) to members of the Mission’s Advisory Board. Mr Burkholder will retire at the end of May. The 20th Advisory Board Meeting of EUBAM saw representatives from EU delegations in Moldova and Ukraine, the foreign ministries, border and law enforcement agencies of Moldova and Ukraine, and international organizations such as United Nations Development Programme, the Organization for Security and Cooperation in Europe and International Organization for Migration gather in Chisinau, Moldova, where the Head of the Delegation of the EU to Ukraine, Jan Tombinski, acted as chairman. During the meeting the Mission also reported its activity covering the period from December 2012 to March 2013. Mr Burkholder shared with the board the results of the 10th Joint Border Control Operation ‘Podolia’, addressed recent developments in the process of demarcation of the Moldova-Ukraine border, and the concept of EUBAM activities for Phase 10, which starts in December 2013. The Advisory Board acknowledged the progress made in EUBAM’s operational support, greater sustainability in capacity-building activities, and its confidence-building efforts in particular, bringing together the customs representatives from Chisinau and Tiraspol following the resumption of rail freight traffic through Transnistria in 2012. Among other outstanding examples of progress achieved has been the establishment of a Jointly Operated Border Crossing Point at Rossoshany-Briceni, and the beginning of joint patrolling on the Moldova-Ukraine border in July 2012. The chairman of the board, Ambassador Tombinski expressed personal gratitude to the Head of EUBAM Mr Udo Burkholder for his work as both Deputy Head of EUBAM and Head of EUBAM since his appointment in January 2008. 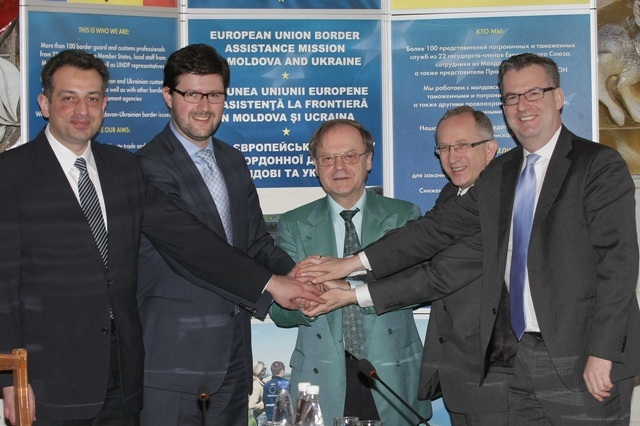 “Under the leadership of Mr Burkholder EUBAM has done a lot in setting good example and passing on European Union standards in border management, which itself is an important part of the reform processes in both Moldova and Ukraine, and also plays a role in the ongoing association and visa-liberalization processes”, he said.